This is brilliant. I’ve heard intimations of it on various websites for the last few months, but it’s always good to see a published paper backing it up. In short, it says that running shoes are not actually necessary for runners. In fact, they may do more to cause damage than to protect. Man has evolved as a creature capable of running. For long distances, on often very hard (and by that I mean the opposite of squishy) terrain. If you don’t believe me, simply look at the runners in, well, large parts of Africa. People running barefoot generally land one of two ways – either on the front/balls of their feet, or else using a ‘mid-foot strike’ in which both ball and heel land simultaneously. This allows the complex feat of structural engineering that is the human body to absorb most of the shock of this impact – the moment when, apparently, running can cause the most injury. However, running shoes change the gait of a runner substantially. By lifting and cushioning the heel, they elongate a runner’s stride, meaning that the impact of striking is the ground is borne by the runner’s heel. and then ricochets upward. This, in turn, leads to a huge amount of jarring – some 1.5-3 times the weight of the runner, much of which happens to the lower leg. This could help account for the impact-related injuries which are experienced by many runners these days, including tibial stress fractures and plantar fasciitis. In order to come to this determination, the researchers looked at three primary groups of people – those who have always undertaken endurance running using athletic footwear (1), those who grew up running either barefoot or minimally shod but now use running shoes (2), and those who grew up using running shoes but now run barefoot or minimally shod (3). They also compared two other groups of people – those who have never worn running shoes (4), and those who have grown up habitually wearing them (5). The upshot of all of this, after looking at all the maths and stuff, is this: your body has been designed, through the millenia, to run either barefoot or with just enough of a sole to protect your feet from the glass shards and goodness-knows-what-else that is such a feature of the modern urban landscape. Wearing running shoes could, in fact, lead to stress injuries. A caveat, however: for those of who count yourselves as being amongst the habitually-shod, don’t simply throw your shoes away and begin your new, natural regime immediately – you will need some time for your body and gait to readjust to this new (yet very old) way of doing things. As with all sports, take it slowly. And, of course, the money you were saving for that very expensive pair of [insert name here]-branded shoes can now be used for something else. Like sending me a real cocktail, across teh interweb, to say thanks. 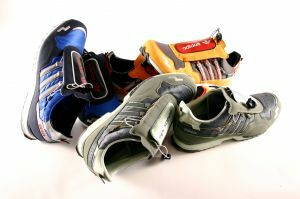 The race shoes of top runners are very light, with little cushioning, a bit like those “barefoot” shoes you point out. I’ve always liked the idea of a pair of something in that style, but last I looked (quite a while ago!) they were expensive and it looked to me as if their soles would wear out way too fast! Must have another look sometime. Top runners, shoes or not, don’t land on their heels, even the top marathon runners. (There’s bound to be exceptions…) Sprinters land on the front of their feet and long-distance athletes with the mid-foot strike you mention. 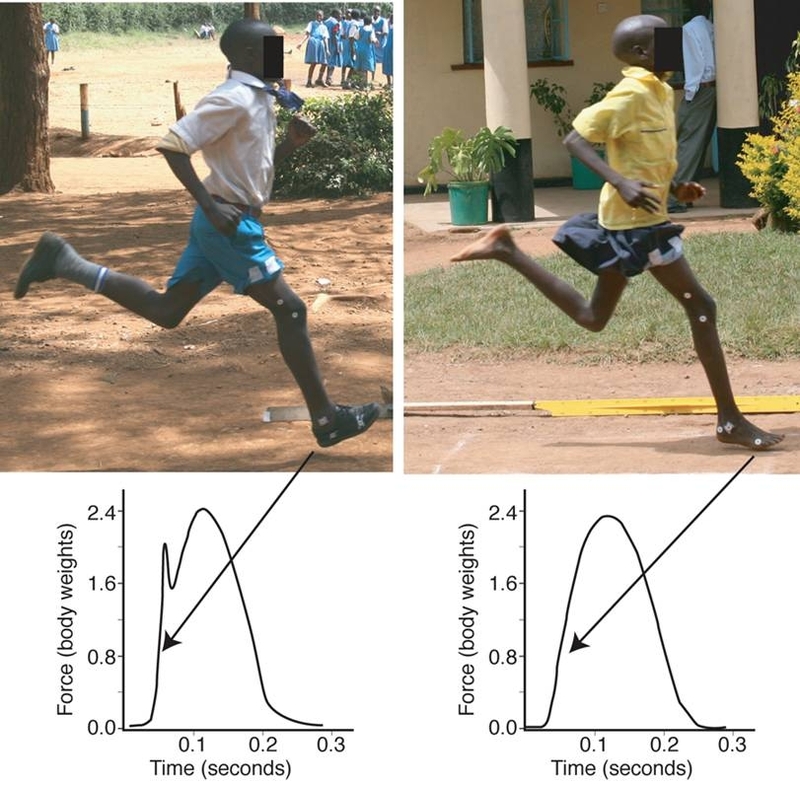 It’s amazing to see how far forward on the foot a top marathon runner lands on their feet, or for that matter middle distance runners (their feet contact the ground slightly behind the balance point from memory). It’s interesting that people “over reach” if they’re used to wearing shoes. (And that top runners must obviously get past that.) I suppose that means for joggers, they should accept that smaller steps better suits a slower pace (i.e. keeping a similar cadence, so the foot strike is more under the body)? I used to be a distance runner. Keep meaning to start up again, but life’s busy, eh? It’s an interesting paper and probably no surprise really. However, the massive variation in, and constantly changing patterns on, the soles of trainers/running shoes has been immensely useful for identifying particular pairs shoes connected with crime. Even narrowing it down to a particular brand and model can help. If there were less patterns because there were less trainers (resulting in greater numbers of shoes with the same sole pattern) burglary cases would be much more difficult to solve, particularly Johnny Recidivist, doing ten burglaries over a weekend… There’s a counter-side to everything, isn’t there?! It’s an interview of the researcher with footage (no pun intended!) of him running. Barefoot, of course. He’s all about barefoot running and I’m sure he’d love to feature this article.